“The sea, autumn mildness, islands bathed in light, fine rain spreading a diaphanous veil over the immortal nakedness of Greece. Happy is the man, I thought, who, before dying, has the good fortune to sail the Aegean Sea.” A passage from the novel, Zorba the Greek by Nikos Kazantzakis. 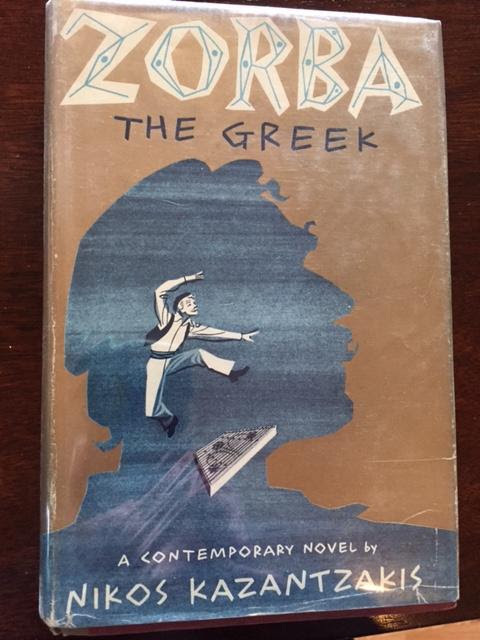 I have followed Nikos Kazantzakis’s Zorba the Greek my entire life. The novel, for me, is filled with life. It enhances what it means to be human, accepting mystery while embracing the sacred awe which is defined as God. You might be thinking, “What the hell does this have to do with fly fishing?” Not much. I have a meandering mind and today it’s embracing Zorba, affirming life at every bend in the novel. For me, fly fishing isn’t a pastime or a hobby, it is a way of life. Fly fishing in Montana is stronger than a passion, we approach it with something akin to religious fervor. We actively proselytize the virtues of fly fishing, advocating for Trout Unlimited (National, State and our Local Chapter), Montana Land Reliance, Ruby Habitat Foundation and Project Healing Waters Fly Fishing. Fly fishing is the interior dialogue that exists between you as an angler and the world of haunted rivers and streams. You might be casting to a rising fish or to the sky, or whatever captures your imagination but there is an invisible metaphysical pull, which hooks all of us. The suggestive tug at the end of the fly line is one of the most poignant expressions of the sublime I know, which says, “Yes” to life. Next to our front door is basket full of fly rods encouraging us to be impulsive, spontaneous, to seize the moment and go fishing. With a fly rod we flow to a better world, a more pure moment to be in a true state of grace. Or perhaps, fly fishing is the simple of act of being able to tell the world to go to hell for a few hours while you stalk a rising trout. Now to the task of keeping food on the table, people employed and hoping to add a little spice to your fishing dreams. Montana is still the stuff dreams are made. 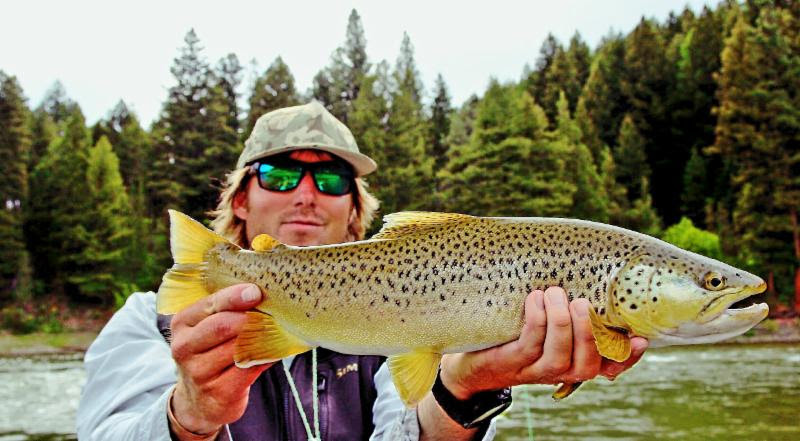 Fly Fishing Schools: Six nights and five days for $3000 per person. Our fly fishing school package includes single room occupancy, all meals at the lodge, and use of loaner equipment. Our guest rooms have two queen-sized beds, private bathroom, wifi, patios with fantastic views. This is a big fish time of year on the Big Hole and the Madison. After breakfast, our guides will conduct a brief classroom instruction followed by guided fly fishing on local waters. -Loop control, loop shapes, grip power application, back cast stop, fore cast stop; timing of pause, foot stance, pickup, follow through; types of casts: single haul, double haul, reach, off shoulder, roll and roll pickup. – Knots, leaders, lines, reels, rods, indicators, straight-line, swing, tying methods. -Rod tip pressure, how to follow out of a heavy current. -Streamer fishing: sinking line, floating line, fishing methods while wading, classic down and across, casting streamer upstream and fast retrieve, dead drift with indicator. -A brief overview of Entomology and fly selection. 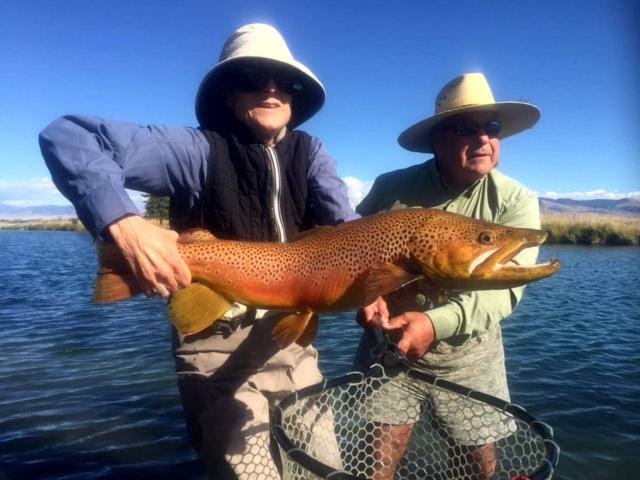 June: Salmon Flies on the Big Hole, Beaverhead is fishing great, with the Jefferson shaping up near the end of the month. July – the first of July we are floating the big rivers: Big Hole, Madison, Jefferson and Beaverhead. Near the end of the month we lean into the private creeks and streams. August – Great month for the Ruby and our small creeks along with the lakes and ponds. People fly to South America to fish lakes for big fish and we have the same opportunities here. A 24 inch trout is doable and very bigly. September – I pity the fishermen that haven’t fished in Montana in the fall. The most glorious poignant time of year. October – The leaves like us are numbered. Get as much life and fishing as you can…. While Nikos Kazantzakis extolled the virtues of the Aegean Sea, we have the mountains and rivers of Montana. I am convinced that on the eighth day God looked around and seeing Montana picked up a fly rod knowing it was a good day to fish. Happy is the man, I think, who, before dying, has the good fortune to fish in Southwest Montana.